When I started my Death Guard Marine it was with the intention of testing out some new colours for my Predator revamp. 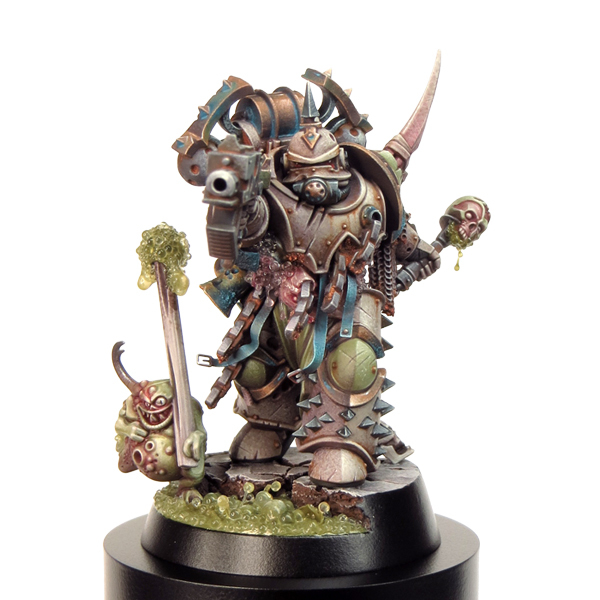 But to be honest, I also had the notion of finishing him in time for the Warhammer 40,000 Open Day 2017, on November 26th. 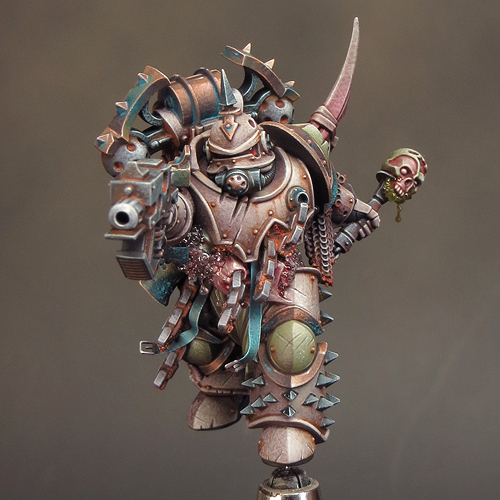 If I could do that I could enter him in the Golden Demon painting competition. This gave me a short-term target to help focus and shake off the last of the painting blues I experienced over my abandoned attempt at the White Dwarf Winners’ Challenge. Taking on a comparatively simple single mini meant that I was able to give it the time and attention needed to do the job ‘properly’. I like to be able to sit back and consider what I’ve done and what I’m going to do next. 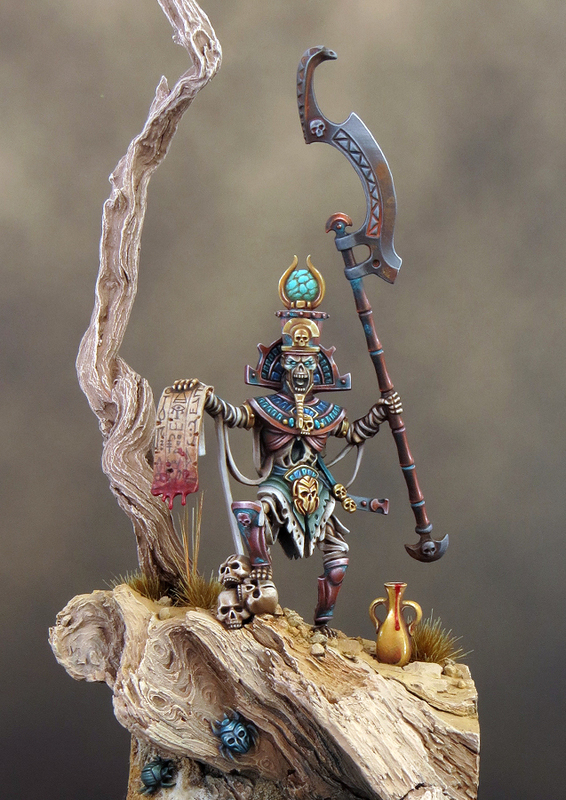 For me the ‘thinking time’ gained when a mini is on the shelf is just as important as ‘painting time’. Refining my work can make the difference between a Bronze and a Gold, or a Gold and a Slayer Sword. I think I can say with some confidence that I’ve got a good instinct for what it takes to win at the Golden Demons! Put very simply if you want to win you can’t cut any corners. But knowing what to do is not the same as doing it and it’s not getting any easier to win - quite the opposite! It may be a cliché to say the standard is going up, but I think it is - and that means I have to pull out all the stops and push my painting to he limit! So all in all I had my work cut out with this mini right from the start. This was partly because of the new colour combinations but mostly because nothing came easily with this paintjob. However a little perseverance can go a long way and, as the 26th got closer, things began to come together. One thing that developed quite late in the project was my use of blue in the overall colour scheme. I always intended to use blue, rather than green, verdigris effects but the more blue I added the more I liked it. As I said in my last post, I think the blue provides a colour contrast that makes the whole colour scheme come together and pop! I decided to get some blue into the front mid-section of the mini, to break up the overall brown tone this area had. 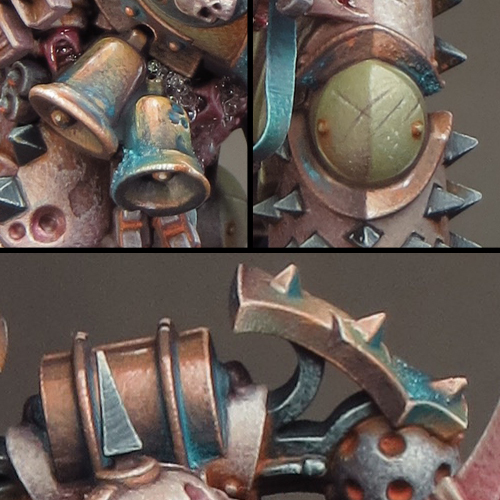 I could have repainted the chains as copper and added verdigris but I liked the rusty iron I’d done, so I decided to try something else. I added some etched brass straps between the chains and painted them blue. It was a fiddly job but well worth the effort. The straps not only introduced a much needed blue element but also provided some extra fine detail and movement to contrast with the heavy armoured form of the mini. For the base I decided to create a bubbling ‘Nurglesque’ swamp within a fractured rocky ground. This is a development of the base I made for my Abyssal Warlord, which struck me as having some potential for a Nurgle themed mini. I will be doing a micro bead mega-tutorial in the near future and a description of how I made this base will be included in that. The marine comes with a Nurgling companion and I decided to have him scampering through the swampy part of the base. 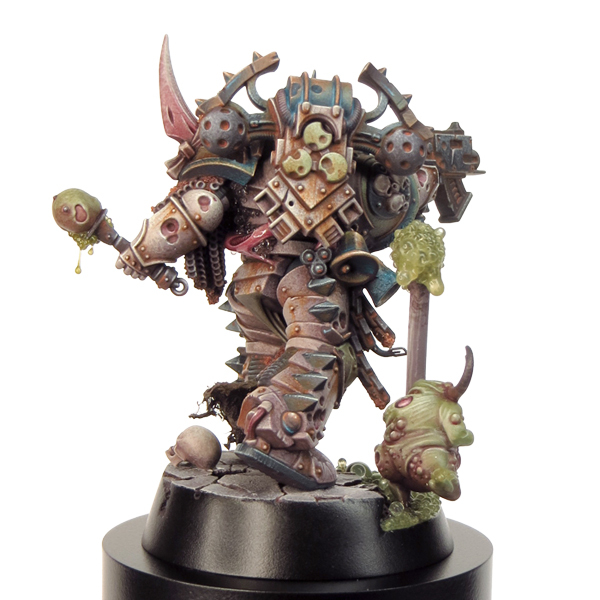 The Nurgling made for a fun mini project in itself but, as the overall paint job on my Death Guard Marine came together, something about the Nurgling began to really bug me! 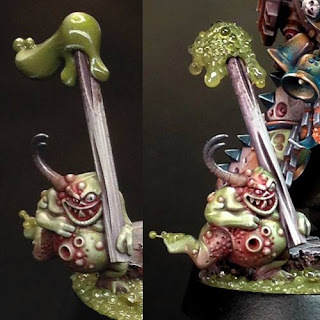 I loved the dollop of gloop that sat on the end of the stick the Nurgling is carrying but I wasn’t happy with how I painted it. I just felt too cartoony for the overall look and feel of the mini. So out came the pliers and scalpel, off came the gloop and on went the microbeads! I find this sort of last minute change nerve-wracking but I think the new gloop fits the overall look of my mini far more successfully. As with my Farseer I’ve used a resin plinth from Darkmessiah Bases but this time I chose a round rather than square plinth. The distinct double lines inset into these bases is an extremely stylish feature and I ‘m very pleased how my minis look on them! The final touch was to create a label for the plinth and this should have been simple but I came close to messing up very badly! I decided to fix a 3-D icon onto the plinth and used a shield to do this. However the shield was flat and although it looked OK from the front there were ugly gaps either side as the plinth was round. 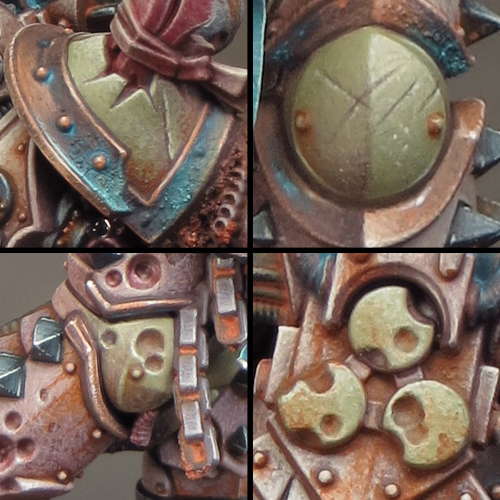 I filled these gaps with microbead slime and a cheeky Nurgling but the whole thing still looked off to my eye! On top of the awkward composition I realized that the icon drew far too much attention away from the mini. I’d thoroughly over complicated what should have been very simple. On the Friday morning before the show I took a deep breath and took the whole horrible lot off the plinth. It was a nasty fiddly job and I feared I was going to make a dreadful mess. Careful work was needed but I managed to remove the icon with only one small chip to the paintwork on the plinth. I then made a label for the plinth that, thankfully, covered up the chip. 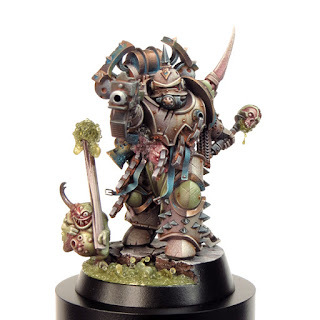 In retrospect I think this mini would have looked fine on a plain plinth but the new label was a huge improvement on the icon because less is almost always more! I went into the competition with mixed feelings. I was very pleased with what I’d achieved but, with only one mini entered, I had all my eggs in one basket and I knew the competition was going to be tough! 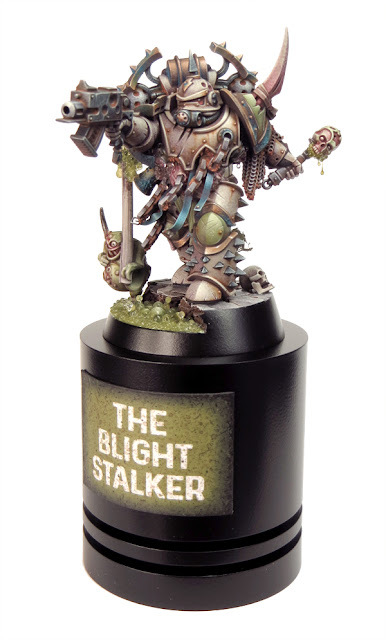 As always the tension built through the day but finally the top three single minis were placed on the top shelf and I knew I had a trophy in that category. That was some relief but then a whole new sort of tension begins to build as you wait to find out just what you’ve got. It was Gold and I was one very happy painter. I find there is a slightly odd moment then, when the first rush of elation passes, and you remember that Gold means you are in the running for the Slayer Sword. Regardless of how many Slayer Swords I’ve won, it’s a moment that never fails to give me butterflies in my stomach! And then it’s my name that’s being called out and I’m up on the stage holding my fifth Slayer Sword! It’s very hard to describe just how that feels. 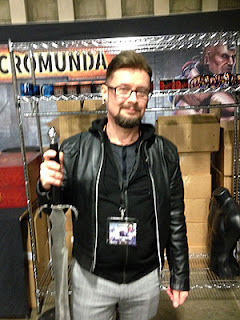 Winning my first two Swords was pretty overwhelming and the experience came in a dizzy rush. The feeling now is somewhat deeper and calmer but no less meaningful. I am tremendously proud and grateful that I have the skill and experience to excel in my hobby. As I said earlier, it’s not getting any easier to win, but that’s part of what makes it worth doing! 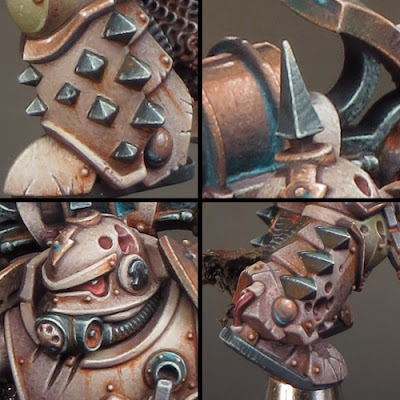 Previously my colour palettes for Nurgle themed minis have been built around a strong red/green contrast using saturated colours. While I may use this approach for some elements of my new Predator, overall I want to work with a more desaturated palette. 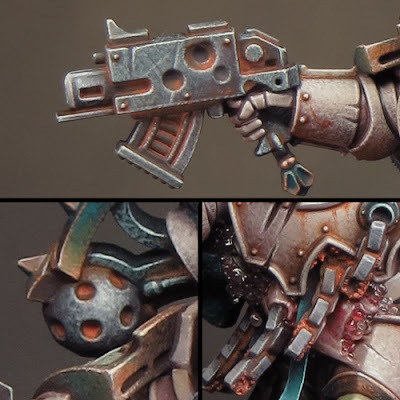 It’s my gut instinct that, on a larger model like the Predator, a desaturated palette will be more effective. I suspect a strong saturated palette, like the one I used on Gutrot Spume, would give the Predator more of a ‘cartoony’ look than I want. Although I didn’t set out to do this, my Death Guard uses a similar palette to the one used on my Tomb King. This is mostly because of the global highlight and shade colours I’ve used. The use of global highlight and shade colours ties the colour scheme together and helps to give the different coloured elements the feel of being in the same environment. It works equally well for both saturated and desaturated palettes. My global shade colour is Black Leather from ScaleColour. As I said in my last posting, this is a desaturated purplish brown that mixes well with most other colours to create shade tones. My global highlight colour is Mojave White also from Scale colour. I often use Ivory for a global highlight and, in contrast to this, Mojave White is a slightly cooler and greyer looking colour that will help with the overall ‘dirty look’ I want to give my Death Guard. These global colours give me an interesting contrast between warm shadows and cooler highlights. The pictures used below to illustrate my colour palette are far more close-up than I would normally show. I think this may be of interest in itself as you can see every brush mark and blemish I've made to create my textures! The bone coloured armour is painted almost entirely with very fine stippling to give an overall texture. I started with a mid-tone base then added the shadows followed by highlights. I then went back and forth between the tones to adjust the overall balance. The final step was to paint the scratches and chips. The green armour was painted in much the same way as the bone coloured armour. 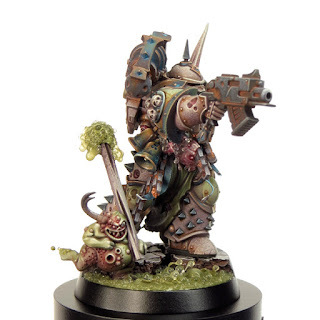 I decided to try the new GW paint Death Guard Green and I’m very pleased I did. This is an extremely flexible colour sitting midway between light/dark and warm/cool. As a result it could form the basis of almost any green colour scheme and I’ll be experimenting further with Death Guard Green in the future. 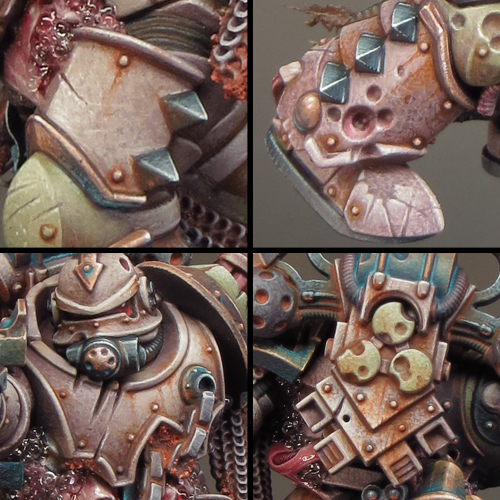 The copper uses a palette of colours I developed earlier that includes Ratskin Flesh to bring a warm, almost pink, tone to it. I was just going to have a little bit of verdigris on this mini but I decided to try a bluer tone than I’ve used before. The use of blue in the overall colour scheme has turned out to be crucial! The blue provides a saturated colour that harmonizes with the greens and contrasts with the browns and oranges. I think the blue makes the whole scheme come together and pop! I’ve combined several blue tones for the verdigris by mixing Sotek Green with other colours from my palette. The addition of Black Leather creates a purple/blue tone while Ratskin Flesh creates a green/blue tone. 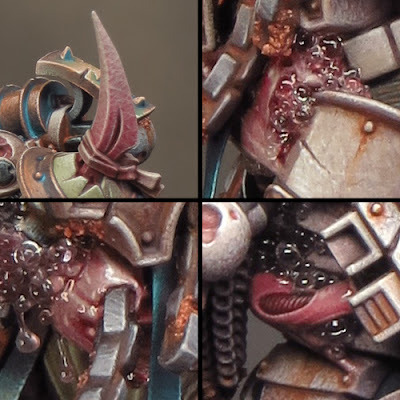 The fleshy parts of the mini are only a small part of the whole but the red and pink tones provide a nice touch of saturation in contrast to the armour and colour contrast with the blue and green. 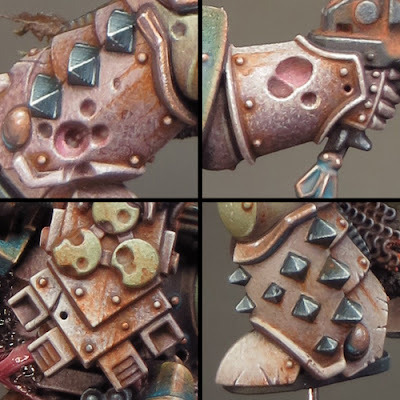 The green iron areas were originally going to be a dark grey/black. But the subtle introduction of a green tone, through the use of Dark Sea Blue, brings more colour into the palette without adding too much extra colour contrast. The combination of Dark Sea Blue and Black Leather is a very useful one. Mixed together these colours give a very dark neutral tone that, when mixed with Mojave White, creates an interesting range of greys. It’s possible to play with warm & cool tonal variations by varying the proportions of the colours used in the mix. I decided to try something different with some of my rust effects this time. The use of Designers Gouache means that the paint, much like pigment powders, can be applied, left to dry and then adjusted with a clean damp brush. This has enabled me to achieve a greater degree of control and subtlety with my rust than I’ve done before. I can see that Designers Gouache, a relic from my schooldays, may well become a staple in my miniature painting from now on, and I’m looking forward to further experimentation with it!